and spied an even bigger flock of birders! This time was extra special, as I finally saw first hand the very bird that is bringing the crowds out with binoculars, monoculars, field guides, floppy hats, telephoto lenses and craned necks: The Scissor-tailed Flycatcher! A dove. Common, I suppose, but I do love them, and their cooing song. Geoff alerts me to the presence of the Bird Watchers. He sees them when he's left for work. Apparently I find watching Bird Watchers irresistibly appealing, because no matter what I am doing, I pull on my boots, grab my camera, call out to whomever might care, The Bird Watchers are out! as I head out the door. Maria has been sorry to miss all the fun. You may recall, she's been keen to do a Big Year, and we've tried our hand at backyard birding. Today, the timing was just right and she and William dashed out the door with me. 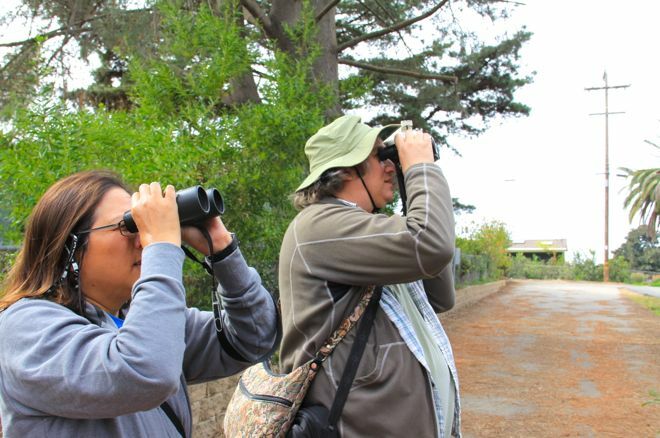 Yes, we hoped to see the Scissor-tailed Flycatcher, but now I am a confirmed watcher of Bird Watchers. I love their passion and enthusiasm, and, for a short time, sharing their adventure. Our new friends today, are Debbie and Scot. They've come from Berkley, by way of the Road to California Quilt Show. Seriously? I could so totally enjoy a quilt show and birding road trip! Our friend, the Scissor-tailed Flycatcher, was shy today. 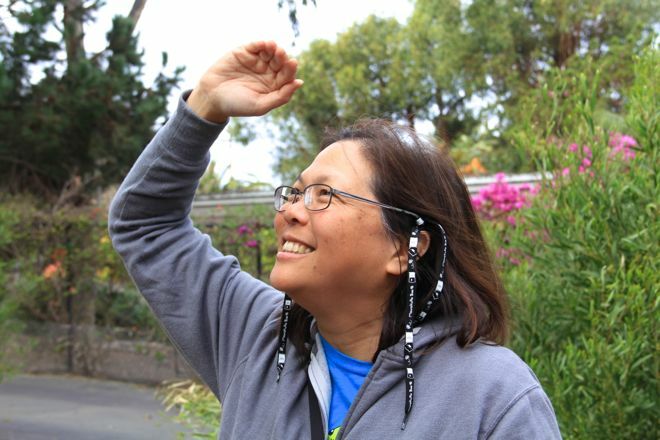 Like our friends, Bonnie and Jeff, Debbie and Scot were really hopeful of seeing a California Gnatcatcher, too. Darling, little bird. I wonder if I'll know it, if we ever cross flight paths. 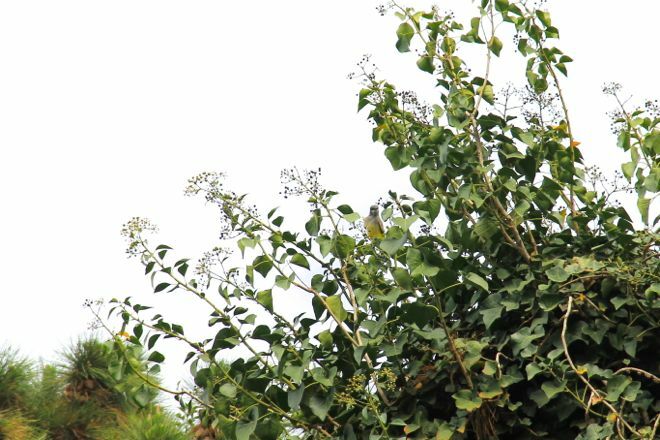 Knowing perfectly well that my lens won't zoom sufficiently, I still can't help trying to get a shot, especially of a bird as bright and pretty as this tiny Goldfinch. Can you see it? I took four pictures. He never did turn his face, but no regrets. I like the memory the picture keeps. Debbie told me about a place in Patagonia, Arizona, where you can sit in Marion and Wally Patton's backyard, and birdwatch. That's funny, because I am starting to think I could do the same, here, at the Bird House. Rather fitting, I think. Then again, maybe chickens aren't what Bird Watchers have in mind! 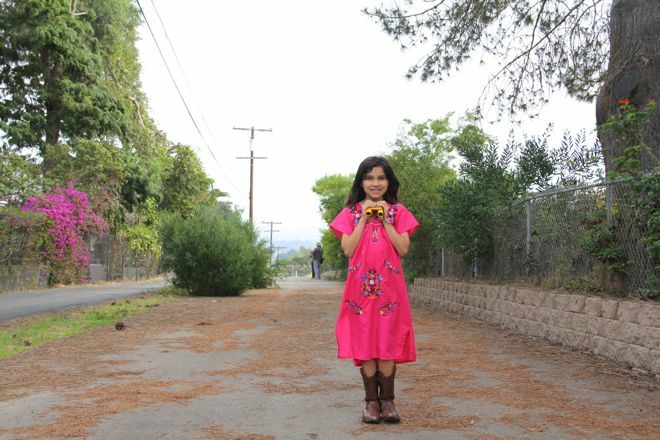 I loved hearing their stories, the bird counts and sightings. Debbie is sketching the birds she sees, and Scot keeps a a small journal, where he names and counts his birds. 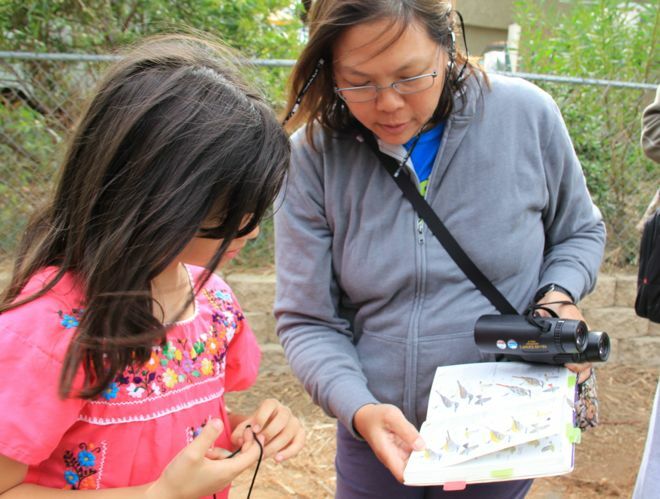 They inspired Maria to find her book, and revise her bird count. Scot and Debbie are planning a trip to Texas... there's great birding in Texas, where Eastern and Western birds can be spied. 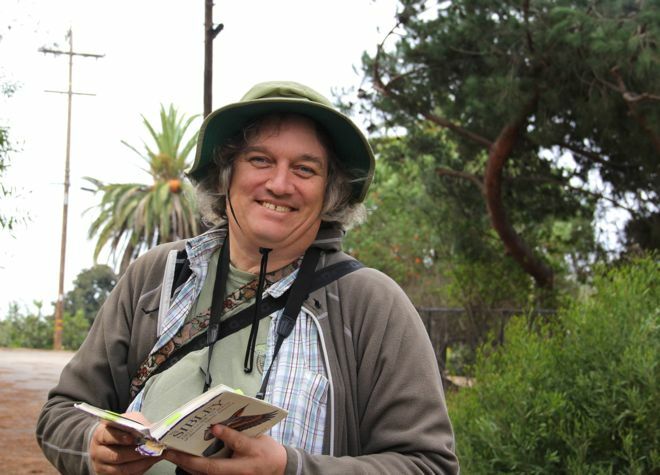 San Diego is tough to beat for weather and bird varieties, and coming soon: the 2014 San Diego Bird Festival! 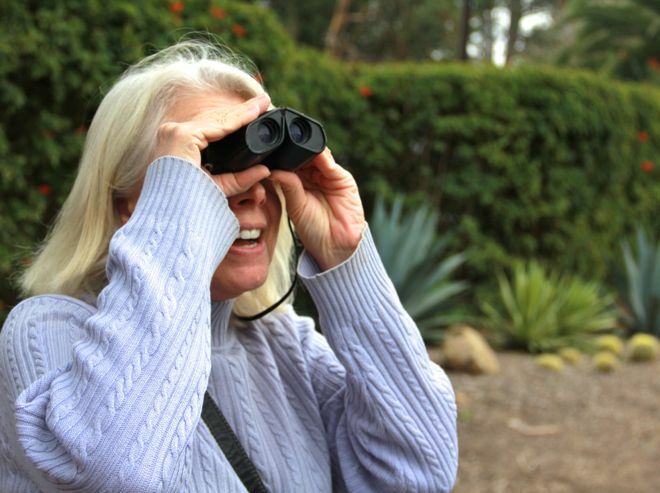 The best parts about Bird Watchers? They're generous, and engaged, they're quietly embracing the bird's world, and enjoying the bird's life, and they're happy to share what they know, what they're enjoying. It's so simple. An innocent pass time, Anna Banana reflected. Meeting the Bird Watchers has become a nice treat. I like to think that these posts will be the first of many, and I will make more new friends, as I see new birds. I learn new things with each encounter, and the feeling of delight when seeing a bird, identifying it, observing it... it's sweet. 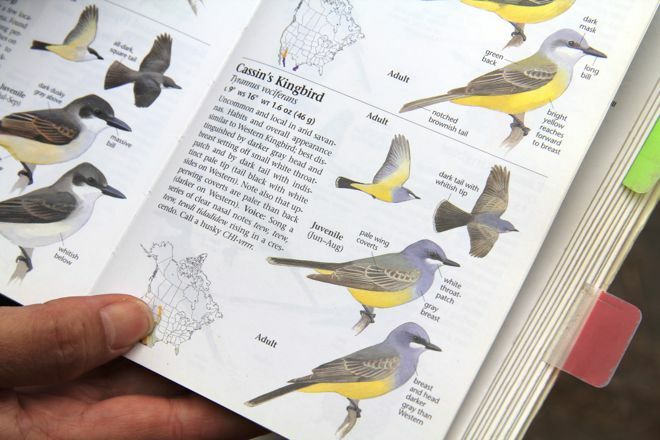 The Cassin's Kingbirds were out, and making a joyful display. After a few sightings, I began to recognize little patterns in his flight, and behavior. 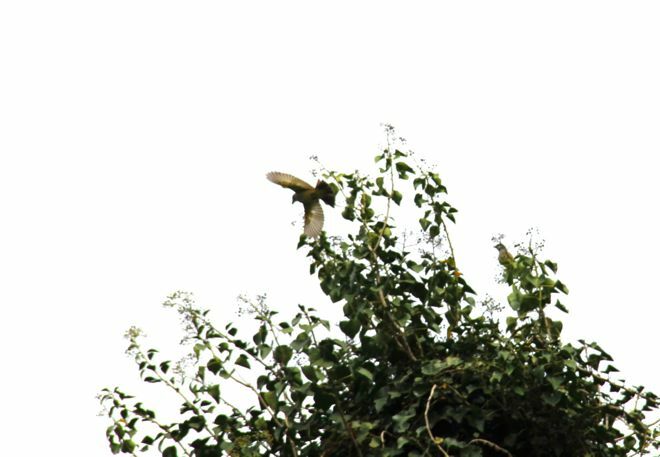 A couple of them were rising and landing off these high branches. 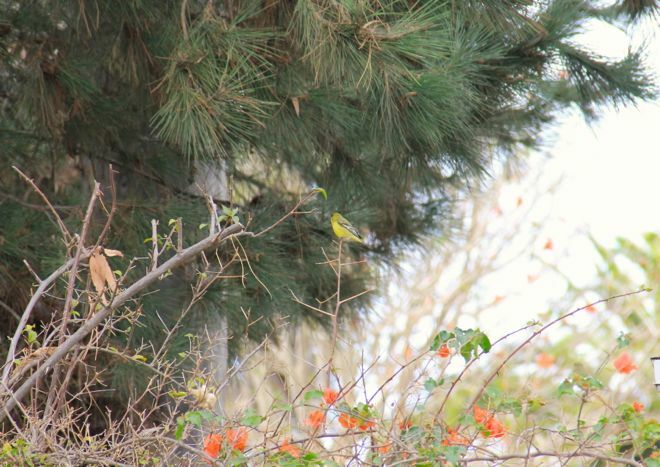 And this time, I think I am sure that Maria and I were definitely seeing the Cassin's Kingbirdsin our tree, a year-and-a-half ago! 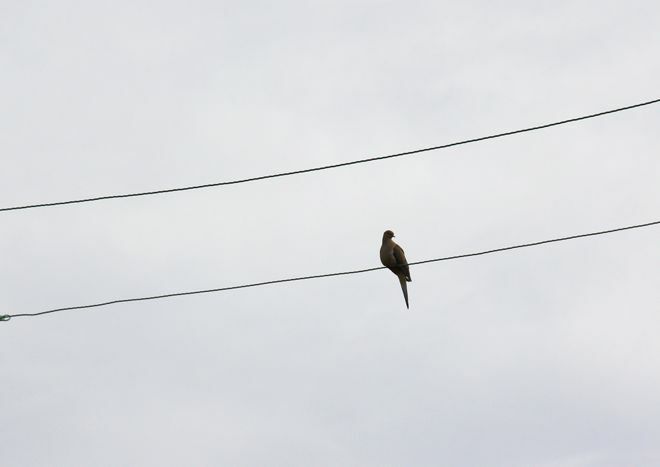 Scot and Debbie were happy to be seeing them, and one left the high branches and sat on the phone line overhead. We were able to enjoy nice, close views. Then we moved on to an open lot where we saw a field full of American Pipets. They were tiny and almost invisible, but once spied, you notice how charming they are, hopping about. 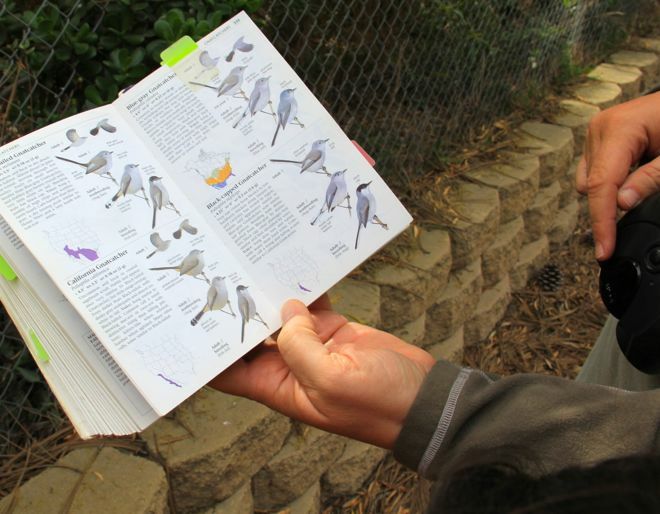 Technically, I might say there is a Fourth chapter to this Birding Saga, because later that afternoon Anna Banana rang me and asked if we could trek out in search of the Scissor-tailed Flycatcher? Indeed! Maria and I were happy for another birding excursion. 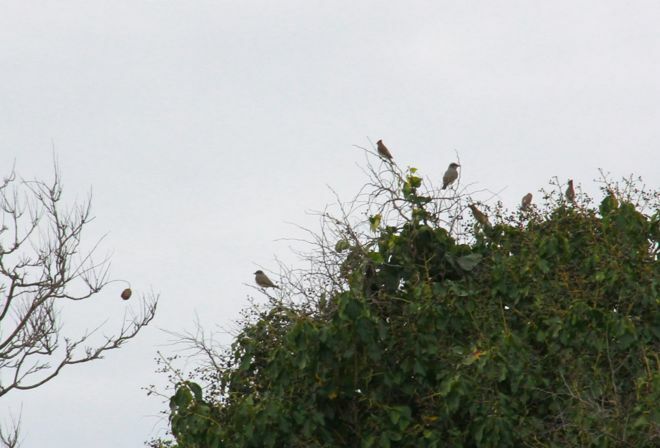 And we were rewarded with a tree full of Cedar Waxwings and more Kingbirds!